When we talk about Shield, it’s impossible not to mention it’s one of the most popular concealed carry firearm out there, that come for a low price. It’s in fact a semi-automatic gun, around 1 inch wide and it’s 9 mm power comes in a very light pack, that also looks pretty good. We like it as it fits so nicely your hands, gloves on or not. The chassis system is efficient and safety is great thanks to the patented deactivation system with thumb safety feature. The shield handgun works the best when carried inside the waistband, which explains our talk on IWB holsters for it. There are multiple choices when it comes to materials on IWB holsters. You can have your pick for your M&P shield from plastic, Kydex or leather IWB holsters. It sure depends a lot on your budget and needs and the main rule still stands: the more you pay, the more you get. The market gives you tuck able or non-tuck able IWB holsters for your Shield 9mm and it’s up to you to decide which way to go. A good IWB holster hides well, but still gives you fast and easy access to your Shield, in case of emergency. It doesn’t shift away nor irritates your skin (especially if it comes in direct contact with your skin). Note to self: if you plan to carry the IWB holster for a whole day, it’s better to go with one that has minimal skin contact and feels soft against your skin also. No matter the material is made of, any IWB holster is a bit tight at first so be patient and give it a couple of days/weeks until it fully breaks in. Don’t forget to pay attention to the details. Remember the rule “the more you pay, the more you get”? Well, you’re not paying the extra buck only for the high quality material or the durability of the holster, but also for its features and adjustability. The better the adjustability (ride height, cant), the bigger the chances you get the right settings in specific situations. No matter how comfortable, adjustable or durable the IWB holster for your M&P Shield 9mm may be, it’s totally useless if it’s not safe. The IWB holster has to offer safety for your Shield and for you as well. The belt clips, the solid clicks should ensure safe placement in the holster, without sacrificing the ability the adjust the holster. Some consider that hybrid holsters (made with leather and Kydex as well) work the best for a Shield 9mm, but it’s up to you to decide which type is the best choice for your Shield. 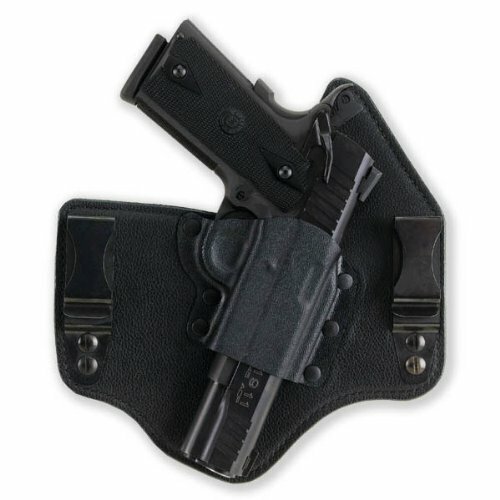 The ambidextrous design of the Blackhawk Appendix Reversible Carry inside the Pants Fits S&W M&P Shield is one of the best thing on the holster that manages to bring many other good things on the table. The holster is comfortable and versatile and its ambidextrous design save you the trouble of paying extra attention when placing your order. 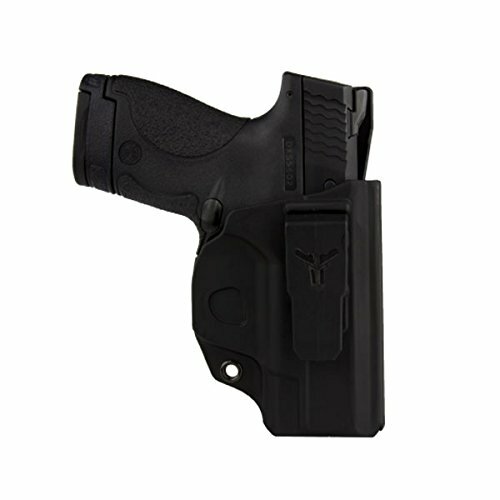 Made of molded polymer, the holster gives a great, snug fit to your gun right out of the box. The list of good things continues with the two belt clips that are good and keep everything safe. 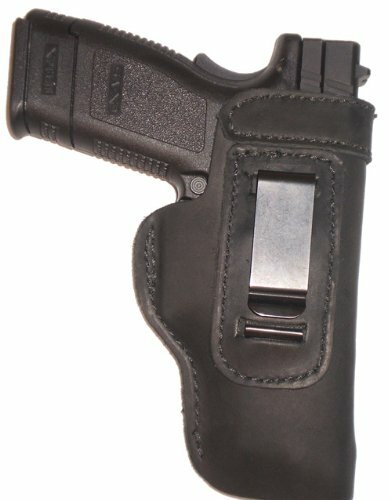 We also notice the adjustable retention detent, which increases the versatility of the holster. You may get in fact the settings you need in specific situations like that. The holster also comes with two cant and ride height adjustment belt clips for 1.5” to 1.75” belts. Adjusting the passive retention detent is not that difficult as you may easily use the adjustment screw. The holster has a minimalist design, but it’s still quite efficient. It gives no hot spots and it has a compact shape. It’s soft and has a rubber feel, bringing comfort on the carry. You may use the holster also for use of rear mounted Red dots. The holster is well made and looks quite nice. Long story short, the holster may present few downsides, but when you check its price and realize its performances, you kind of realize it’s quite a bang for your buck. Just because you go shopping on a fixed budget, doesn’t mean you have to go back home empty handed. The Blade-Tech Industries Klipt S&W M&P Shield 9/40 is good option for your Shield and you only have to pay a few bucks for it. The holster stands out with a slim profile and a thin construction that hides it so well under your shirt. It has minimal to none imprinting and you can barely notice it. This doesn’t mean it’s less efficient, though and the holster is designed to conceal and carry safely your small gun. However, there’s more than low profile to the holster. The positive lock trigger guard lets you hear a specific click when your firearm is fully seated. The holster performs best when carried in appendix style, but you may easily wear as an IWB. The clip attachment fits belts of 1.75 inch width. 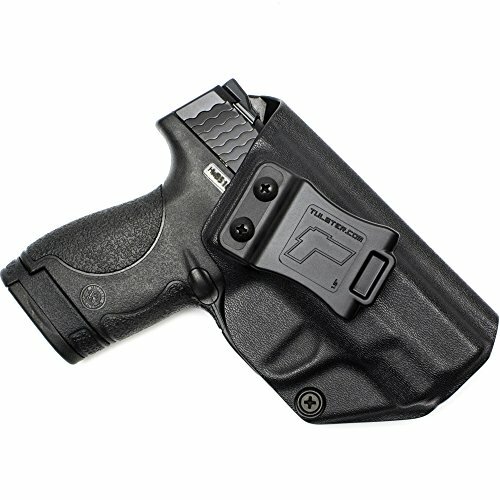 The holster is made with Blade-Tech precision molded, tough polymers. 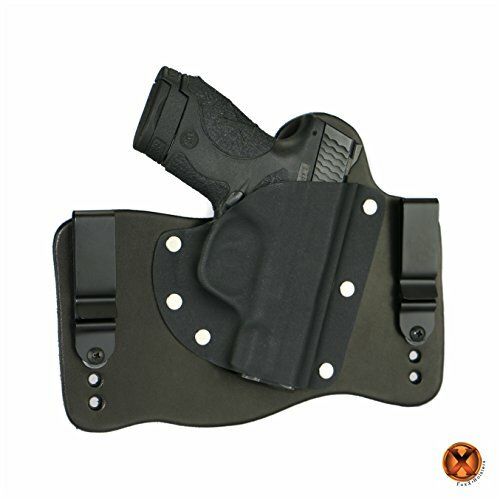 The holster is long lasting and gives a snug fit to your Shield. The drawing is fast and easy and you get instant access to your gun. The retention is spot on and the holster conceals very well. It secures efficiently your gun and it’s very manageable. The holster is made here at home in our USA and has a long lasting built. All in all, for a low price though, you get a rather good quality IWB holster that hides safe and secure your Shield, just like any IWB holster is supposed to do anyway. Let your misconceptions at home, as you can actually get pretty good leather IWB holster without paying an arm and a leg for it. The Ultimate Suede Leather IWB Holster manages to combine a low profile with a tough, so it’s comfortable and durable altogether. The holster is made with soft suede leather and it doesn’t need much time to break in. The principle is simple: the more you wear it, the softer it gets. The concealment is fast and easy and you can definitely rely on the retention. The belt clip is functional and tough, keeping everything safe and secure. The form-fitted design gives a nice fit to your Shield, with minimal risk for marring its finish. The holster is quite versatile and it may fit other gun models. The soft suede leather leaves a nice soft touch feel and it’s quite gentle against your skin. We also like the breathability of the holster that manages to remain nice and cool even in the hot summer. The clip is sturdy and reinforced with leather. The stitching is good and the holster presents a good built, long lasting. On top of everything else, the holster is made here at home in our USA. All in all, for a very good price, you get a dependable, leather, versatile holster that is made right here in our USA. The lightweight Smith & Wesson M&P Shield Pro Carry LT CCW IWB Leather Gun Holster Black surprises with its good fit and reliability, especially considering its price. The holster is made with soft leather so it’s quite flexible, without minimizing the safety on the carry. It doesn’t matter if you move around or simply sit down, as the holster is comfortable to wear for many hours. It’s very well made and the stitches ensure a nice, good fit to your Shield. It’s designed for right hand used, but you may also get the left hand option. 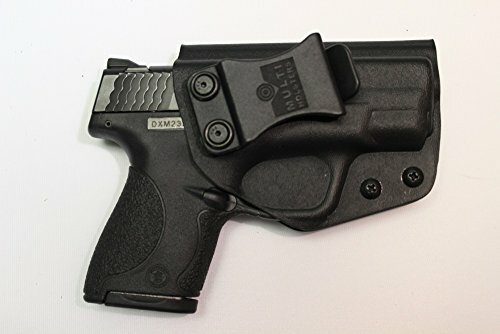 The list of features looks quite good and the holster presents an adjustable cant (from 0 to 15 degrees) and a smooth drawing. It comes with a gun blued metal clip that looks strong and dependable. The holster is easy to conceal and it rides rather low. It has a nice finish and a low profile. It doesn’t shift away and stays in place, no matter how much you move. It has a solid build and leaves a durability feel. The belt clip is wider so you may move as much as you want and the click is very solid. The holster also looks good and comes with a lifetime warranty. Nevertheless, for a good price, you get a pretty good, lightweight holster that keeps you safe and secure, no matter how much you move. Especially designed to fit your Smith & Wesson M&P SHIELD 9 / 40, the Concealment Express IWB KYDEX Holster is both lightweight and comfortable to wear. It has a rather low profile, which makes it so subtle and almost impossible to detect. The slim design and low profile have a big say on the comfort also and you may easily wear the holster throughout the entire day, with minimal to none discomfort. The minimalistic design doesn’t have a bad influence on the safety though and the holster keeps your gun (and yourself) safe and secure, no matter how much you move. We also notice the adjustability of the holster that allows you to set the retention and the carry angle (from 0 to 15 degrees, just the way you need it in a specific situation). The clip on the holster is tough and efficient and the “Posi-Click” retention lock system is audible, informing you when your gun is set to go. The retention is good and adjustable. The holster covers almost entirely your gun and keeps debris away from your gun. The full sweat shield protects you and your gun from corrosive perspiration, increasing the durability of the gun. The nice fit and great finish, with no sharp edges don’t scratch your gun, nor your skin either. It’s easy to draw/holster and to use the holster. The holster is made here at home in our USA and it’s a very popular choice. The cons don’t matter much when we take a look at the whole picture that gives us the image of a dependable, subtle, safe holster that became so popular for its quality and price. 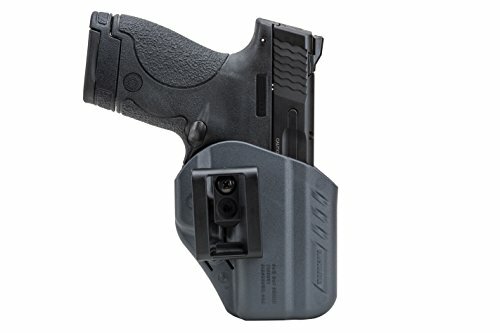 If you are looking for a hybrid holster for your Shield that is also tuck able, a reliable option is the FoxX Holsters Smith & Wesson M&P Shield 9mm & 40 IWB Hybrid Holster Tuckable. The holster combines two long lasting materials, leather and Kydex so it’s durable and comfortable, ensuring a good fit to your Shield 9mm. it doesn’t need much time to break in and the more you wear it, the softer it gets. We like the adjustability of the holster and you can set the ride height and the forward cant, depending on your needs at some point. The tension is good and the concealment is reliable. The holster has a small profile, which means the imprinting is minimal. The holster hides very well under your shirt, without losing its efficiency. The holster has a good built, doesn’t shift away, no matter what kind of activity you’re doing. Its black steel belt clips are strong and keep it in place. The drawing is smooth and easy and you have easy access to your gun at all time. The holster holds your gun nice and fit, but the sliding is smooth. The holster is very well made and leaves a durability feeling. All in all, for a good price, you get a tuck able, reliable and durable IWB holster that hides well and keeps you safe, which is so important for an IWB holster. We all have to admit it: there’s something about the leather IWB holsters that other holsters simply don’t have. It may be from the specific leather smell or the elegant vibe that any leather product has, but when it comes to leather IWB holsters, you know you’re not going to make a mistake. The New Barsony Brown Leather IWB Holster is made with high quality soft leather so it’s ready to wear right out of the box. 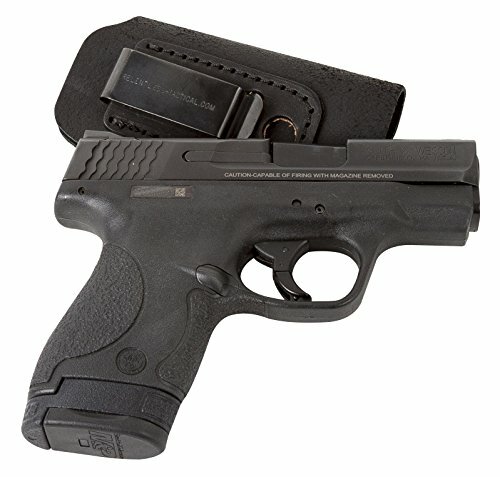 It also comes with a functional magazine pouch that is sub compact 9mm 40 and 45. The craftsmanship of the holster is high quality and the stitching brings out the best of the cowhide leather used on the holster. The holster manages to be lightweight though and very comfortable to carry. Even though the holster is soft, it still holds secure and safe your gun. The concealment is good and the drawing is easy. The holster fits belts as wide as 1 ¾” inches and is well made. The metal clip is strong and the holster is easy to use. Let’s not forget the holster is made here at home in our USA and this may seal the deal for many. Despite the minor flaws, for the quality of materials, craftsmanship and, why not, its looks, the holster is a dependable option to consider. When it comes to comfort, speed and efficiency, some say that nothing beats the Galco KT652B Kingtuk Inside the Waistband Gun Holster for S&W M&P Shield 9/40. 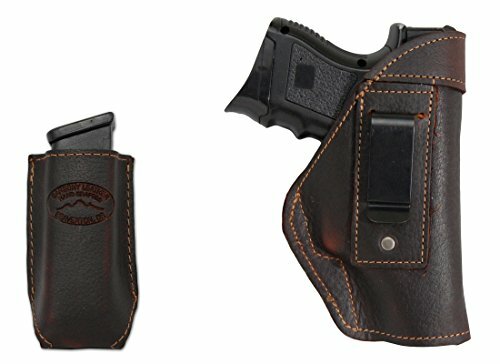 The hybrid holster features a leather back panel that adjusts to the curves of your body and a tight, molded Kydex front panel. It comes with adjustable metal clips that help you adjust the ride angle and the height ride just the way you need it. The backing plate is made with saddle leather with Napa leather front and the holster only needs a couple of days to break in. the tough Kydex holster pocket ensures quick draw and smooth holstering each time. The interchangeable injection molded nylon C-hooks that fit belts up to 1 ¼” may be used and bought separately. The C-hooks sustain a lower profile on the belt and provide better concealability. The holster comes with standard metal clips that fits belts up to 1-3/4”. The retention on the holster is great and the holster is comfortable to wear even for straight 12 hours. It has a good balance and the stitching is durable. No matter the minor issues, for a fair price, you get a dependable, adjustable and well-made holster for your Shield. 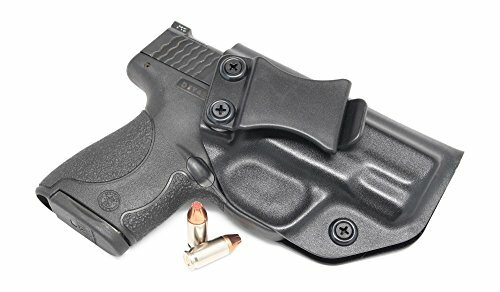 Made here at home in our USA, the Multi Holsters Elite Smith & Wesson M&P Shield 9/40 IWB checks all the things you’d expect from a high quality IWB holster: it’s safe, dependable, well made and comfortable. The holster is made with Accu-Pressed Process, so it gives a snug fit to your gun. It’s very well made, doesn’t slip and snaps in place every time. The list of good features looks nice and includes an adjustable tension as you may tighten/loosen the screws on the holster. The cant is also adjustable and you may set it from 0 to 15 degrees, by adjusting the FOMI clip. The holster also features a FOMI clip that attaches safely your holster to your belt. The single clip is wide and looks quite strong. It fits 1.5” belts and the reverse tab lets you remove it fast and easy. The retention is great and the holster presents a positive click when re-holstering. The draw is smooth and it’s easy to remove the holster with just one hand. The holster is thin, lightweight and it’s easy to put on/take off. It’s compact and has a great feel to it. The body shield protects you and your gun from perspiration and helps you when re-holstering. 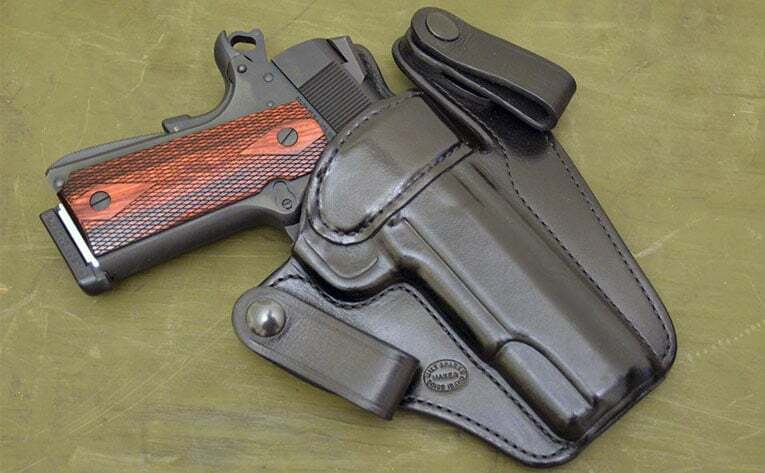 The design is good and the holster is rigid, with durable feel. In a nutshell, we like the holster for the performances, high quality and safe feeling it has and we really don’t think the cons are deal breakers for us. The more you pay, the more you get and the M&P Shield 9mm/.40 Holster Tulster Profile Holster brings many great things on the table, even though you may want to double check its price when you first see it. When it comes to this holster, we wouldn’t know what to begin with. The concealment is great and the adjustability is impressive. You may set the carry angle from 0 to 15 degrees and this means you worry no more about your gun when jumping/walking or sitting down. The holster also comes with adjustable retention and the positive retention Snap lets you know (you hear it and feel it as well) when your gun is securely holstered. The design of the holster is well thought out and eliminates the material between the muzzle and retention screw. This increases the comfort and minimizes the risk for the holster to dig into your body. The grip is high as the trigger guard is undercut. The holster presents smooth edges and doesn’t irritate your skin. It’s easy to out on/take off and holds pretty well. You may comfortably wear it all day long. The injection molded belt clip combines very well with the soft loop, making the holster more versatile. A full sweat shield protects you and your gun against corrosive perspiration. It’s impossible not to notice the high quality craftsmanship and the nice finish of the holster. Don’t get lost in the minor details though and think of this holster as a great investment of your money. What are the Best Tactical Vests in 2019? © 2016 Rangermade.net. All rights reserved.